It’s no secret I’m a big fan of cookbooks. I have quite a collection that varies depending on where I’m traveling or what is influencing me at the time. Lately, that influence has been taking a closer look at what we eat with an eye to doing a little tweaking. Although our meals are generally pretty healthy — we try to avoid processed foods and consume a lot of vegetables, there is definitely room for improvement. It was a pretty busy Spring, and with not as much time to cook, those cheat days start slipping into cheat weeks. Plus, we’re going on a Mediterranean cruise later this summer, and it would be really nice to avoid having to buy a new (larger) swimsuit. A couple of weeks ago, I was surfing around on Amazon and found a cookbook called “The Dude Diet,” by Serena Wolf. Normally I would skip right over any cookbook with the word “diet” in the title, much less “dude.” However, having just consumed a plate of nachos at Chilis and with that cruise looming, I decided to take a closer look, and I’m so glad I did. This is a book that’s written for my life right now – way too busy to do a lot of all-day cooking and starting to think of nachos as a food group. It’s not a book that I’ll cook from everyday, but when I need ideas for made-from-scratch lunches or dinners for busy weeknights, this is a winner. It’s a nice collection of healthy recipes that don’t skimp on flavor. And the fact that the author is a graduate of Le Cordon Bleu Paris doesn’t hurt. The book arrived, and after skimming through it, I decided to start with this post’s recipe – a quinoa casserole with cheeseburger flavors. My husband follows the “Primal Blueprint” a Paleoish grain-free diet. I’m totally on board with that and try to be supportive, but I’m not ready to give up grains entirely. Therefore, finding meals that suit both of us can sometimes be a challenge. So when I found out that quinoa was considered more of a seed than a grain and was now permitted on the Primal Blueprint plan, I was not disappointed. And my husband was not disappointed in the dish, which is really saying something. He would have preferred more burger and less quinoa, but we both liked it, and it was a quick and easy dish to prepare for the week’s lunches. 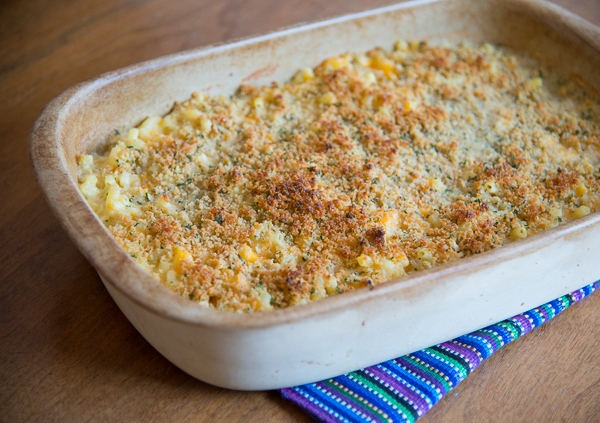 This is a versatile casserole that could be changed up in a variety of ways. Just think of your favorite burger toppings – sautéed mushrooms, jalapenos, bacon bits, etc. Feel free to swap out cheeses as well. Pecorino or Swiss come to mind. I used gluten free Panko, but any other type will be fine. Combine the quinoa and the beef broth in a small saucepan and bring to a boil over high heat. Lower to a simmer, cover, and cook for 14 minutes until all the liquid has been absorbed. Remove from heat and allow the quinoa to rest, covered, for 5 minutes. Fluff quinoa with a fork. Preheat the oven to 375. Combine the Panko, sesame seeds and 1/2 teaspoon of the smoked paprika in a small bowl and set aside. Heat the olive oil in a 12-inch ovenproof skillet over medium heat. Add the onion and the garlic and cook for 4 to 5 minutes until soft and translucent. Add the ground beef, salt, pepper, and remaining 1/2 teaspoon smoked paprika to the skillet and cook, stirring, until meat is no longer pink. Add the tomato paste, mustard and Worcestershire sauce to the pan and cook for 3 more minutes. Stir the diced tomatoes into the meat mixture, then mix in the quinoa and 1/2 cup of the cheese. Sprinkle the top of the mixture with the remaining cheese, followed by the Panko mixture. Bake for 25 minutes until bubbly and the top is golden brown. Remove from the oven and allow to rest for 10 minutes before serving. Okay, I surrender. I’ve had enough! Bring on Spring. I promise I won’t even complain when the heat and humidity of July roll around. It’s cold and gray, which wouldn’t be so bad if we had some snow coming down. Snow day! But so far, winter has been one long drawn out gloomy stretch of 20-30-degree days, some rain or sleet spitting out of the sky occasionally, usually during morning rush hour, and not much else. Days like this call for drastic measures. It’s time to get out the gardening books and dream of nicer days to come…flowers, fruits and vegetables, green leaves, and birds singing. It’s also time for some serious comfort food. 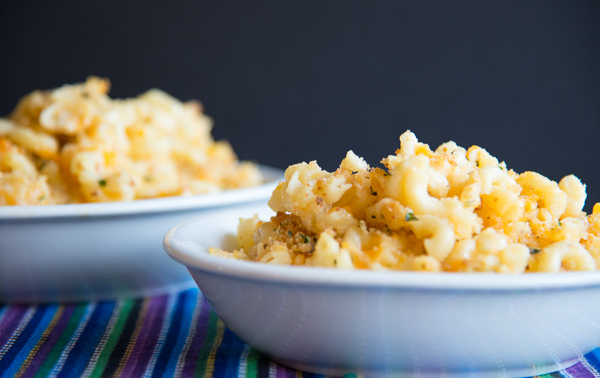 Macaroni and cheese comes to mind, and this recipe does not disappoint. 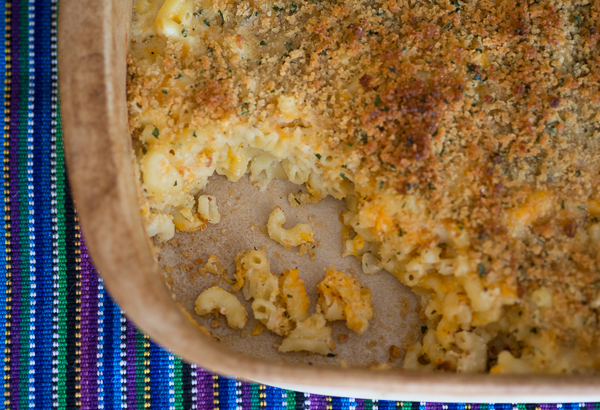 Rather than preparing the sauce and boiling the macaroni separately, the hot sauce is poured over the dry macaroni and baked. It couldn’t be easier and the result is delicious. 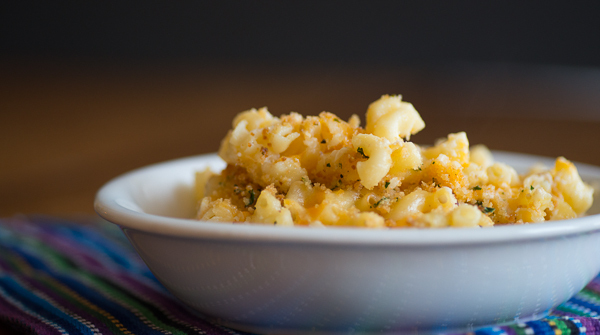 The macaroni still has a nice bite to it, and the sauce cooks up perfectly creamy and cheesy. 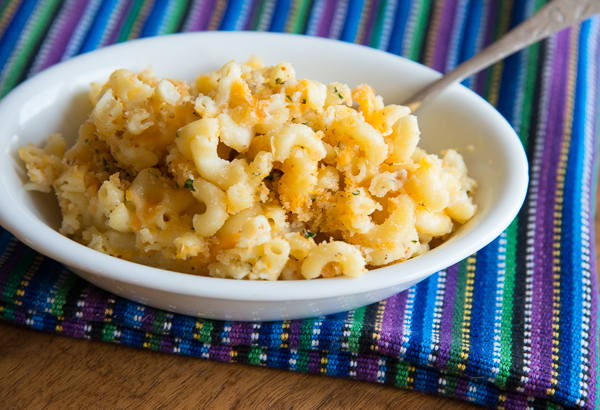 You could easily vary the type of cheese used to add some variety. When making the sauce, adding a little of the liquid at a time, 2-3 times and whisking between each addition before adding the remaining milk/water, will make a smoother sauce and prevent it from breaking. Preheat oven to 400 degrees. Melt half of the butter in a large saucepan over medium heat. Add flour and whisk until a paste forms, about 1 minute. Slowly add the milk a little at a time, whisking between each addition before adding the remaining milk and 3 cups of water. Bring saucepan contents to a boil, lower heat to a simmer, and cook, stirring frequently until mixture thickens to a thin glossy sauce, about 10 minutes. Stir in 1 tablespoon salt and 1/2 teaspoon pepper. Remove from heat. 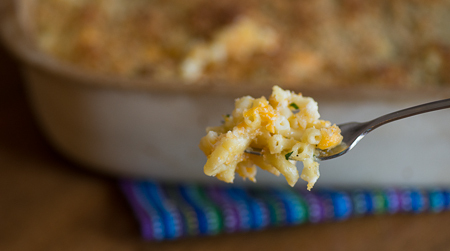 Toss the pasta and 1 1/2 cups of the cheese in a 9×13 or other 3-quart baking dish. Pour the sauce over the pasta, submerging the pasta. Do not stir. Cover the dish with foil, place in the oven and bake for 20 minutes. Meanwhile, melt the remaining 1/4 cup butter in a large skillet over medium heat. Or you can do what I did and just wipe out the saucepan and use that to avoid dirtying up another pan. Add garlic, Panko, and parsley and toss to combine. Season with salt and pepper. Take the dish out of the oven and remove the foil. The pasta will be almost tender, but there will still be a lot of liquid. Don’t worry it will cook. Sprinkle with the remaining 1/2 cup of cheese and the Panko mixture. Place the pan back in the oven (without the foil) and bake until the edges are bubbling and the top is golden brown, about 10 minutes. Allow pasta to stand 10 minutes before serving.